Oklahoma didn't become a state until 1907. Before then, it was called Indian Territory and was a haven for outlaws, cutthroats, and renegades. A thousand years before statehood, Oklahoma was arguably the home of the most powerful tribe of Indians in either North of South America. The Mississippians were superb artisans as seen by the intricate artifacts of their culture. The most powerful arm of the Mississippians lived near the eastern Oklahoma town of Spiro on a bluff overlooking an oxbow bend in the Arkansas River. They were called Mound Builders because they lived in dwellings perched atop large pyramid-like structures. The spiritual leader of Native Americans from two continents lived in the Mississippian settlement near Spiro, Oklahoma and the tribe hosted a Summer Solstice Ceremony every year for thousands of believers. An artifact found at many Mississippian archeological sites is a black pottery cup used in their tea ceremony. It's quite possible that the 'Black Cup of Oklahoma' is the most significant and spiritual relic remaining of the Mississippian culture. 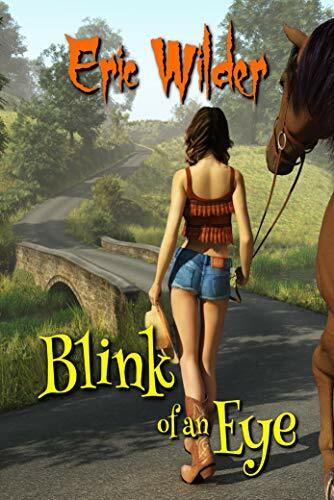 Blink of an Eye is my latest mystery/thriller in the Paranormal Cowboy Series. In Chapter 1 my flawed cowboy detective Buck McDivit, a young man that can't mind his own business, rescues an old Indian from a fiery truck crash. The event launches him into a paranormal adventure in perhaps the wildest and remotest part of Oklahoma. What he finds there is all but unbelievable. If you like action, adventure, mystery, fantasy, and prehistory, please give it a read and see for yourself. I hope you love it. Late for dinner and a movie with his steady girlfriend Lynn, Buck McDivit raced down I-35. Almost sundown, snowflakes from a late spring snowstorm dusted his windshield. As sunset began turning the sky red, an old pickup appeared over the rise in the northbound lane. 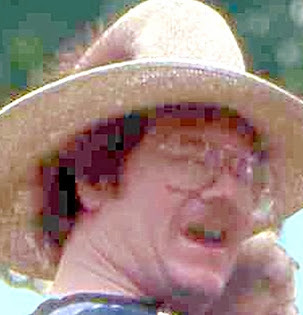 Almost out of control, the driver flashed his headlights when he saw Buck’s truck. In less than a moment, he realized why the old pickup was in such a hurry. A black truck doing ninety or more crested the rise behind it. The speeding vehicle slammed into the pickup's rear bumper, swerving it. “What the hell?” Buck said. Tapping his brakes, he slowed just enough to cross the grassy median in a sliding skid. When he hit the pavement, he floored the gas pedal in an attempt to catch the two speeding vehicles. The big V8 in his Navigator responded with a revving engine and squeal of burning rubber. The speedometer reached a hundred as he crested a rolling hill and caught up with the two vehicles in front of him. The truck kept banging the old pickup, finally spinning it and sending it into the ditch. It flipped in the air doing a slow-motion tumble before hitting a sandstone outcrop. Buck dialed 911. The black truck slowed just enough to give Buck time to read its license tag. The personalized plate said BladeRunner. With other things more pressing on his mind, he watched as it disappeared over a rolling hill. Slamming the brakes, he slid to within thirty feet as the truck caught fire and started to burn. Without bothering to shut the door, he raced to the burning vehicle. The truck lay on its side; the hood popped and dark smoke billowing from the engine. Jumping on the running board, Buck grabbed the door handle and yanked. An old man lay crumpled behind the wheel, his eyes closed. He felt light as a feather as Buck wrestled him from the cab. Dragging him, he tried to get as far away from the burning truck as he could. They almost made it. When the truck exploded, the concussion knocked him off his feet. Slamming into the pavement, he skidded on knees and elbows, his face scraping asphalt. Hot air warmed his neck as it blasted over his head. The old man opened his eyes when he patted his face. “I knew it was you when I saw your truck,” he said in a whispered voice. The old man’s eyes closed and he grew silent without answering the question. Scant minutes had passed before sirens began screaming. An emergency vehicle from the Guthrie fire department skidded to a halt behind them. Two EMT’s that Buck recognized raced to help. Clint was short, had a pug nose and a fireplug body. His partner Bones McGee was twice as tall and half as wide. The two EMT’s loaded the old man into the back of the ambulance and then returned to check on Buck. “You look like hell,” Bones said. “Where you taking him?” Buck asked. Traffic had begun stacking up on I-35, police vehicles and rubberneckers slowing traffic. At least until a semi racing toward Wichita crested the rise. By the time he saw the congestion, it was too late. The big truck careened full throttle into Buck’s Navigator. Both vehicles ended up in the ditch as firefighters rushed to check on the driver. Buck would have helped but the collision had knocked him smooth out. Ammonia beneath his nose opened his eyes. Buck was in no position to argue. After assisting him to the ambulance, they raced away in a blast of sirens and screech of burning rubber. He recovered enough to touch the shoulder of the old man on the gurney as Bones adjusted the IV in his veins. “How’s he doing?” Buck asked. The old man’s bone structure and hooked nose pegged him as a Native American. He opened his eyes and smiled when he saw Buck. “I knew I’d find you,” he said. “You know me?” Buck asked. He fumbled with something in the pocket of his faded shirt. Buck took the object, turning it in his hand. The old man didn’t answer, his eyes closing again. “We’re losing him,” Bones said, pumping his chest. The faint blink of a dark Indian eye showed them he was still alive. “Hang in there, Chief,” Buck said. A wisp of a smile appeared on the wizened face of the old Indian as he grasped Buck’s hand and squeezed. When his hand relaxed, Buck knew, he was dead. Bones checked his pulse, and then covered his face with the sheet. “You knew him?” he asked. “Never saw him before,” Buck said. “A beautiful woman I once knew. Don’t have a clue what this thing is,” he said. “Let me have it, and I’ll call it in,” Bones said. Buck glanced at his skinned elbows and blisters on his palms. After wiping the blood from his face with his blue bandanna, he wrapped it around his right hand. Bones didn’t let him finish, moving around the cot to check him out. “Least you’re alive,” Bones said, glancing at the body of the old man covered with the sheet.